A covert, in-mission, full kill chain, integrated, Mine Warfare Autonomous Underwater Vehicle (AUV) is described. It will significantly compress the kill chain beyond today’s overt detect to engage methods. It also eliminates or reduces costs associated with today’s multi-system approach. Over time, the MCM practice will inevitably evolve from overt to covert: this natural transition is discussed. The Navy asserts that time line improvements are urgently needed, but equally important is improved affordability. Cost savings for the integrated AUV are expected to be less than $5K per mine kill. The paper describes significant potential to reduce system costs using an integrated AUV solution instead of the multi-system approach of RMMV, AQS-20 and Archerfish. Such a AUV include the vehicle itself, with its associated power and propulsion and maneuvering systems, autonomous embedded intelligence, navigation system, sonar and other sensor systems, and weapon payload. 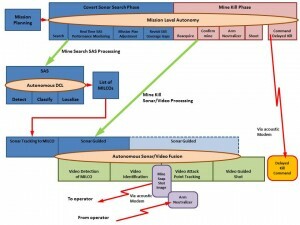 For the AUV’s primary sensor, Thales has developed the advanced SAMDIS (Synthetic Aperture sonar (SAS) Mine Detection Imaging System) which has onboard processing to autonomously detect, classify and localize stealthy mine targets with a high probability of detection and low probability of false alarm. SAMDIS processing also autonomously adapts behavior during the mission. SAS survey mode has 1.0 inch by 1.2 inch resolution out to 150 m range and multi-aspect classification mode 1.5 inch by 2 inch resolution out to 120 m range. SAMDIS’ autonomy enables a weapon payload to be added to the AUV for single sortie mine detection and neutralization. SAMDIS was fielded in FY 2014 on a 27 inch diameter TRL-9 AUV. It is an open architecture and modular system with future growth potential to incorporate new features via spiral development and it is currently in production. A second essential technology is autonomous sonar and video perception processing. This technology has been developed both by Naval Special Warfare Center, Panama City Division (NSWC PCD) and by Thales to Technology Readiness Level (TRL) 6 and above. It is used on Autonomous Mine Disposal Vehicles (AMDV) such as Archerfish and K-Ster. This processing will be leveraged in the fire control module for a Hunter-Killer AUV to deliver a weapon or place an explosive charge. A suitable weapon technology is a light-weight composite 30 mm launcher that would implant a round filled with either high explosives (HE) (for an explosive hard-kill) or reactive material (for a soft kill burn). Similar technology was developed by DTRA to counter roadside IEDs using .50 cal weapons. A 30 mm implant would be usefully larger and could integrate a 1316 compliant fusing device. Utilizing an EFI detonator enables digital fusing and affords either timed or controlled detonation, including detonation by an acoustically transmitted command. All these launch sensing, switch and fusing capabilities are currently “in-use” in penetrating darts that are already at TRL 6 and above. The launcher would weigh between 13 and 20 pounds. Its barrel could be constructed using a metal liner with composite over wrap to provide strength and rigidity while minimizing weight. To simplify the launcher and minimize weight a cartridge-less round using an electronic primer for its firing mechanism would be used. The launcher muzzle could be sealed with a frangible material that would allow it to operate at water depths exceeding 100m while allowing the projectile to be launched with minimal resistance. This launcher would be the only technology below TRL 6. However, three separate organizations 1) Naval Undersea Warfare Center (NUWC) Newport 20 mm water to water gun for torpedo defense, 2) DSG Technologies (www.dsgtec.com) and 3) AAC have matured in-water technology that operates stably using super-cavitation. A 30mm launcher provides sufficient terminal velocity to penetrate .5 inch cold rolled steel from a range of 30 feet. The key capability to penetrate and anchor a time delayed detonation device without setting off the target was demonstrated in 2014 by AAC and EMPI. Water, due to its density, has a profound impact upon the terminal velocity of the implant at the target; a large change in terminal velocity only needs a slight change in range. The currently achieved standoff range of 30 feet is not sufficient to ensure safety of the AUV should the shot detonate the mine. Shooting from longer ranges requires significant basic research and development, both in material strengths and in achieving precise sonar fire-control accuracies before truly safe standoff ranges are achievable. Both DSG and AAC have repeating fire 30 mm launcher concepts with a multi-kill per sortie capability. The figure illustrates the DSG 30 mm projectile. The AUV communicates with the surface ship through radio and acoustic links for low volume tactical data; the detailed high volume sonar and navigation data are recorded onboard and downloaded post mission. The concept of covertly mine clearing is to automatically reacquire the target, re-detect mine-like echoes in the area, and then approach using the best echoes. 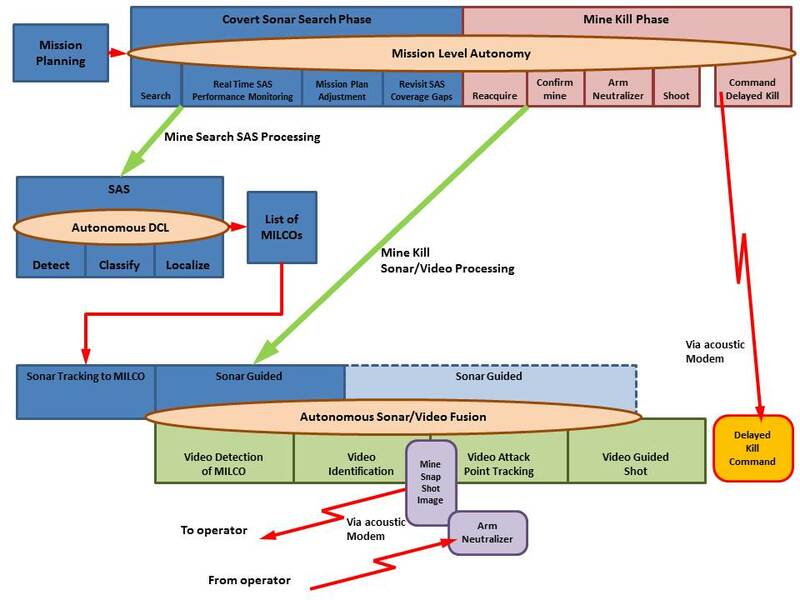 At a short range, the object is identified autonomously by the sonar and video perception processing; then if it is a mine, the AUV works through the risks and best approaches so as not to jeopardize the mission with any single mine kill , and would only then arm a weapon, place a charge, or fire a neutralization device. The neutralization device could provide delayed detonation if needed. The autonomy is most effective when the AUV engages multiple targets in a mission. This type of autonomy is achievable today. An intermediate concept of operation would transition today’s overt practices into the covertly operating concept just described. In the near-term, the autonomous fire-control will send one compressed image wirelessly; that is used by an operator to assess and then commit to the target; then the operator would issue the wireless command to gate open the final arming stages that progress all the autonomous fires upon the target. The image payload is constrained by the limited bandwidth of such a wireless link. That means the autonomy must maneuver to make the best identifying image to compress and send. Methods for transmitting a still snapshot picture via an acoustic modem are already being practiced. For example, Thales has demonstrated this capability for the VAMA program in Europe. 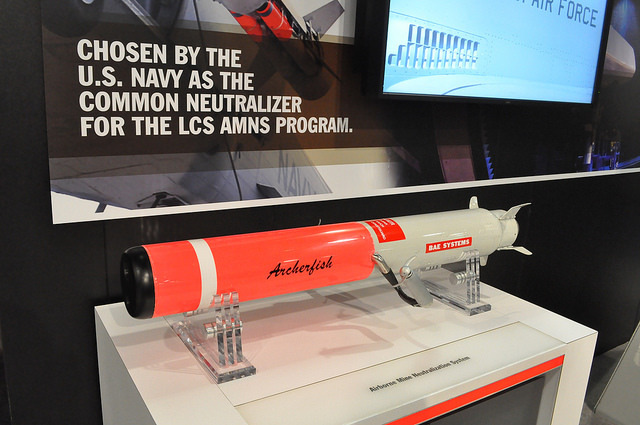 An in-mission full kill chain integrated AUV would dramatically compress the kill chain from traditional Navy detect to engage approaches. It will also eliminate and reduce costs compared to their multi-system approach. Over time, the MCM practice will transition from overt to covert. The time line savings still need to be modeled and validated, but early estimates calculate 3000% improvement, or several orders of magnitude savings in operational time lines. Cost savings are similar because the mine kill per engagement with a 30 mm device are estimated to be less than $5K per mine kill. The reduction in system cost is potentially huge by scaling to one system that replaces the multi-system of RMMV, AQS-20 and MH-60S Archerfish neutralization placement. Terry Miller, Capt, USN Retired – Career Special Operations Diver with over 24 years in Mine Warfare, working for Advanced Acoustic Concepts (AAC) a joint venture company owned by DRS Technologies and Thales. He is a veteran of Desert Storm, USS Tripoli and USS Princeton mine strikes and conducted the first influence sweep in combat since the Korean War onboard USS Leader MSO 490. Terry has over 4000 hours of sonar contact time and ROV operations in combat, in training, and in simulated training against various mine shapes. He served on the Avenger MCM class as Division Officer, Executive Officer and Commanding Officer. He was the OPNAV Branch Head for Mine Warfare and ASN/RDA Acquisition Coordinator to JIDDO for Counter IED. John Rapp – Systems engineer with 35 years experience in the defense industry, working for AAC as Director of Advanced Systems. He is a multi-disciplined inventor with 36 US patents awarded; one-third regard underwater weapons. The Algerian Navy has been on a buying frenzy in recent years, amassing a significant maritime force. In September 2014, representing the culmination of a longer term procurement project, Italy’s Orizzonte Sistemi Navali (OSN) delivered Algeria’s new flagship, an 8,800-tonne amphibious assault ship called the Kalaat Beni-Abbes. But newer projects than OSN’s are currently underway. 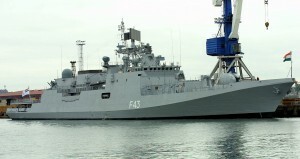 A shipyard in Saint Petersburg, Russia is building two new Kilo-class diesel-electric submarines for Algeria, while two MEKO A200-class frigates, three F-22P Zulfiquar-class frigates, and two Tigr-class corvettes are being produced for service in the Algerian National Navy at shipyards ranging from Kiel to Karachi. This vastly outpaces the procurement projects of Algeria’s neighbours. In 1993, Algeria and Tunisia successfully resolved their maritime boundary dispute and have since launched several joint energy exploration projects. Tunisia’s 2010-2011 revolution and concerns in Algeria that the uprising might bring an Islamist regime to power created some uncertainty, but the bilateral relationship remains on the whole quite positive. Although the nearby Strait of Gibraltar has seen some heightened tension between British and Spanish maritime forces, Algeria is not a party to any of these confrontations. In this context, the aggressive expansion of the Algerian National Navy must be rather confusing. 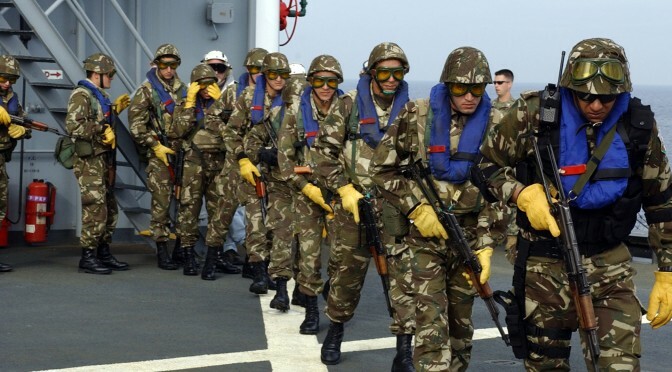 However, it is possible that Algeria is preparing for a significant counter-piracy role. NATO’s Operation Unified Protector devastated the Libyan Navy. 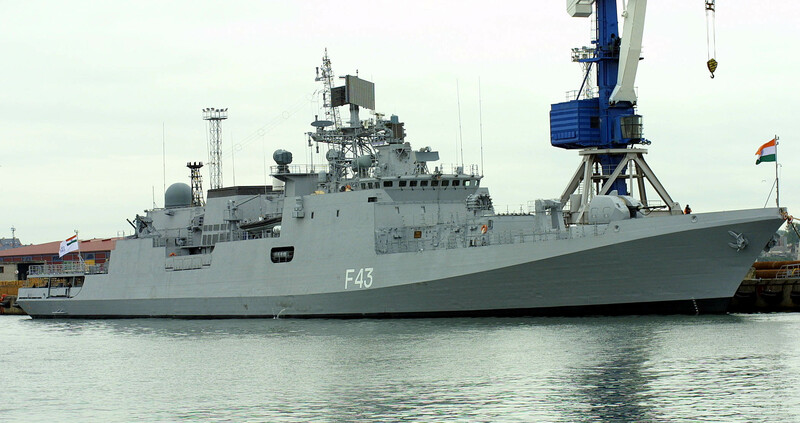 Currently, that country’s maritime forces consist of one Koni-class frigate, one Natya-class minesweeper, and two Polnocny-C landing ships. NATO air strikes in May 2011 totally destroyed Libya’s naval bases at Sirte, Khoms, and Tripoli. While the maritime forces loyal to the Libyan government are small in number and poorly equipped, rebels continue to hold a few ports in Libya’s east, though most were freed in a series of offensives during the summer and autumn of 2014. Earlier, in March 2014, one rebel militia succeeded in loading an oil tanker in defiance of the Libyan authorities, prompting the ouster of Prime Minister Ali Zeidan. If the Libyan authorities are struggling to secure their own ports, it is conceivable that rebel groups in the country’s eastern regions could engage in piracy in future years. Such a situation would jeopardize Algeria’s economic growth as it seeks to become a major energy exporter to Europe and Asia. In March 2014, Algerian officials announced plans to increase oil and natural gas production by 13% to 220 million metric tonnes of oil equivalent in two years. The resulting increase in tanker traffic on North Africa’s coast would present plenty of prime targets for Libyan pirates. 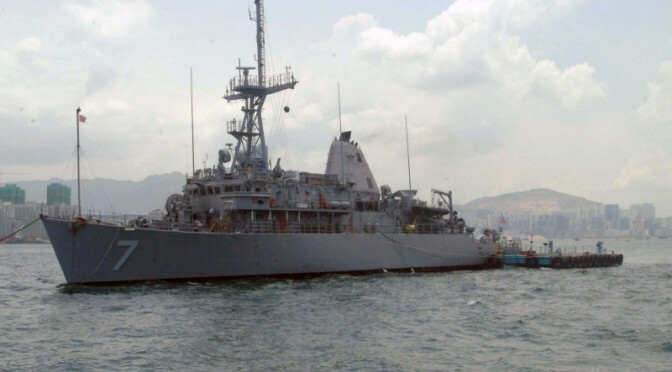 Yet it remains unclear whether it is indeed a counter-piracy role that is envisioned for the Algerian National Navy. Algeria is not officially cooperating with Operation Active Endeavour, which is NATO’s counter-terrorism and counter-proliferation force in the Mediterranean Sea, though five ships assigned to the NATO Mine Counter-Measures Group did make a port visit to Algiers in September 2014 prior to joining Active Endeavour. In order to avoid conflict from emerging between Algeria and Libya over the security of international shipping routes, it may be necessary for NATO officials to aggressively pursue a closer relationship with both countries. Through the Mediterranean Dialogue, NATO established an Individual Cooperation Program (ICP) with Israel in 2006, which allows for Israeli participation in Operation Active Endeavour and other mutually beneficial initiatives. Other ICPs were completed with Egypt in 2007 and Jordan in 2009. Securing ICPs with Algeria and Libya, however, will be an uphill battle; Algeria has participated in NATO’s Mediterranean Dialogue since 2000 but Libya has yet to even respond to a 2012 invitation to join. Nonetheless, it is still an effort worth attempting as it may help to avoid much hardship and conflict in the future. For now, Algeria seems to be bracing for impact. Paul Pryce is a Research Analyst at the Atlantic Council of Canada. His research interests are diverse and include maritime security, NATO affairs, and African regional integration. This article can be found in its original form at Atlantic Council of Canada. The US Navy recently announced that it will make more use of submarine drones, contracting with marine technology developer Teledyne Benthos to re-purpose the Slocum Glider as an instrument used for military activity. The contract is worth $203.7M. 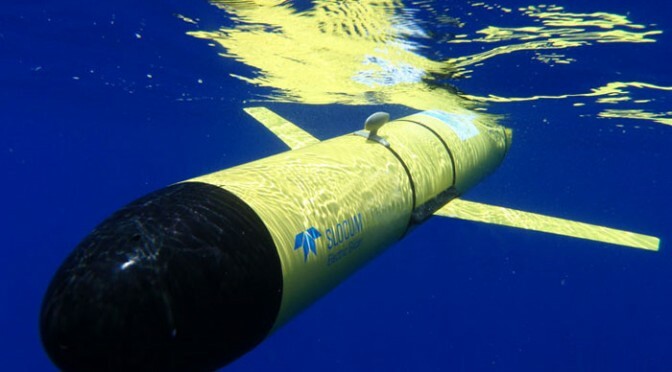 If you haven’t heard of it yet, here is what the Slocum Glider is: a 5 foot-long autonomous underwater vehicle capable of moving to specific locations and descending to depths of 4,000 feet. It is driven by variable buoyancy, and it can move both horizontally and vertically. The Slocum Glider can be programmed to patrol for weeks at a time, collecting data on its environment, surfacing to transmit to shore while downloading new instructions at regular intervals. Compared to traditional methods, the drones have a relative small cost: the need for personnel and infrastructure is reduced to its minimum and the vehicle is able to work around the clock and around the calendar. It works very well: in November 2012, an autonomous glider set a Guinness World Record by traveling over 14,000 kilometers on an autonomous journey of just over one year duration! Many Navies and ocean research organizations already use a wide variety of gliders, which cost around $100,000. But the US Navy now plans to increase the number of those drones from 65 to 150 by 2015. In its 2015 budget request, the US Defense Advanced Research Projects Agency even claimed for $19 million to develop drones “that can provide non-lethal effects or situational awareness over large maritime areas.” This represents a spending increase of nearly 60 percent over 2014! The good news for us is that these submarine drones, unlike the majority of airborne drones, won’t use environmentally unfriendly fuel. Instead, the glider is propelled by the thermocline, which is thermal energy found between the upper and lower mixed layers of sea water. The upper surface has a near atmospheric temperature while the deep water ocean has a temperature situated between 2 and 4 °C. Those new submarine drones can be used to predict the weather by collecting an enormous amount of data at various spots in the ocean. In 2011, a US Government Accountability Office report warned that without improvements to their earth-monitoring capabilities, the USA would “not be able to provide key environmental data that are important for sustaining climate and space weather measurements”; data for warnings of extreme events such as hurricanes, storm surges, and floods would then be less accurate and timely. This led the US Navy to make a deal to share the Navy Ocean Forecast System software with the National Ocean and Atmospheric Administration. But that’s not all: another autonomous submarine drone, the Bluefin-21, created by the American company Bluefin Robotics, has scanned just over 300 square kilometers of Indian Ocean seabed searching for the wreckage of the lost Malaysian plane, whichdisappeared from radar screens on 8th March. The drone was launched from the Australian Defence Vessel Ocean Shield. Bluefin-21 is an autonomous underwater vehicle, 4.93 meters long and 53 centimeters in diameter, specially designed for detection, recognition and statements in the seabed.It is capable of carrying various sensors and payloads. This technology, called side-scan sonar, builds a picture of the seabed at a 4500 meters depth. This drone also has a significant autonomy, 25 hours at 3 knots average, which allows it to achieve extended underwater missions.It weighs 750pounds, which makes it easily transportable by a wide range of boats. From all this, it is clear that submarine drones will become an important part of the navies’ equipment! Earlier this week, guest blogger Mark Tempest posted some interesting ideas on low cost alternatives to traditional combatants that could be configured to carry unmanned surface vehicles, playing on the idea that payload truly is more important than platform. These concepts are unorthodox, though as Mark points out, not unprecedented. In a time of shrinking budgets and smaller fleets, the navy should explore how to optimize various combinations of ships and the unmanned vehicles they will carry, with an eye towards both effectiveness and efficiency. Mine counter-measures is an important, though often short-changed mission, with various trade-offs between payload and platform. Between the Littoral Combat Ship “seaframe” and mission modules, the U.S. Navy has invested billions of dollars in R&D and acquisition money to develop (though still not fully) the capability to conduct off-board, unmanned mine counter-measures. LCS will carry the Remote Minehunting System, a rather large, complex, diesel-powered snorkeling vehicle which has been under development for about two decades. RMS is designed to tow a side scan sonar in order to detect mines. Contrast that arrangement with the Coastal Command Boat, pictured here with an embarked Kingfish, an unmanned underwater vehicle which essentially performs the same job as the RMS with its synthetic aperture sonar. The CCB, or the follow-on MK VI patrol boat can carry two of these UUVs. A well deck equipped amphibious ship (LPD, LSD, LHD) could be configured to carry multiple MK VIs, resulting in the ability to rapidly deploy several UUVs over a wide area at any given time. 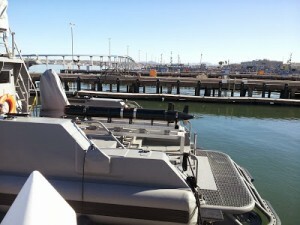 Additionally these patrol boats, or as Mark suggests, another Craft of Opportunity, could be forward deployed or prepositioned in various overseas ports, including ones too small or too politically sensitive to station a larger combatant. An LCS can bring an MCM capability to a mine field at 40 knots, much more rapidly than dedicated MCM ship. A C-17 with patrol boats and a UUV Det can transport MCM package at 10 times that fast. Certainly there are other trade-offs in capability, cost, and versatility in all these options. Given these emerging MCM alternatives, future fleet experimentation to identify other payload/platform configurations that can achieve the same operational results as the LCS/RMS package in a more affordable manner is certainly warranted. Because of the relatively low cost involved in these platforms and UUVs, the answer doesn’t have to be all or none and more than one alternative can be pursued without breaking the bank.